It’s always a good day when you get your stolen, $230,000 Tyrannosaurus skull back. 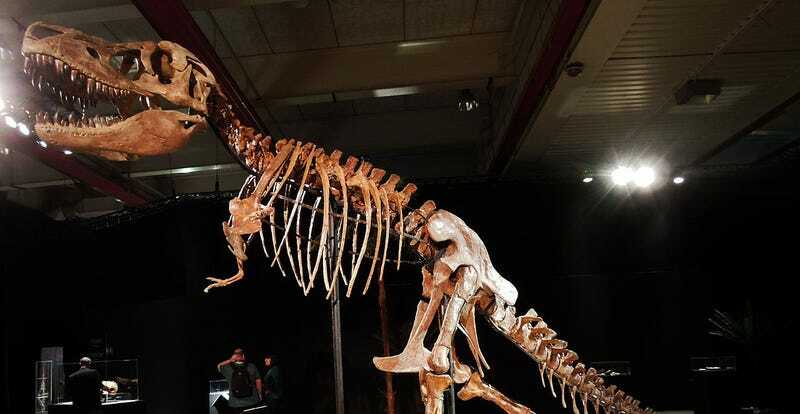 That was Mongolia’s lucky break this week, after US attorney Preet Bharara filed a civil forfeiture complaint regarding a certain Tyrannosaurus bataar skull that entered the United States unlawfully in 2006 and was sold for $230,000 (plus a buyer’s premium of $46,000) at a California auction house in 2007. A rare cousin of T. rex, T. bataar flourished in the modern-day Mongolia’s Gobi Desert in the late Cretaceous some 70 million years ago. As a Mongolian native, the animals’ mortal remains are considered “cultural artifacts” and belong to the Mongolian government by law. But in 2006, some wise guy decided to pull a fast one and list a T. bataar skull on a customs form as “fossil stone pieces.” It worked, and the fossil stones were soon sold for an impressive price tag to an anonymous buyer. Homeland Security Investigations examined the skull in September 2015, and confirmed that it “rightfully belongs to the government of Mongolia and had been illegally imported into the United States.” It’s but one of many, many ancient reptilians the US has had to relinquish to Mongolian authorities over the past few years, including, according to The Guardian, three full T. Bataar skeletons, six Oviraptors, a Protoceratops, and numerous prehistoric lizards and turtles. Update: As an astute commenter pointed out, it appears that the skull in question was purchased by one Nicolas Cage. Could this be the National Treasure he’s been seeking all these years?